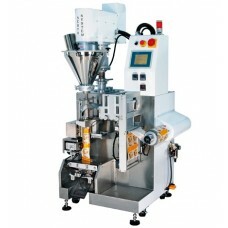 Designed for automatic bag forming filling and packaging for various powder bags (small package) and handy bags. Related Products Name: Small Packaging Machines. The Auto Filling Packing Machine - CC-1204 automatic bag forming filling metering packaging machine is suitable for all types of free-flow and non free-flow powder and granular products. The machine is designed with a gusset type sealing mechanism, ensuring smooth appearance of product without pin-hole problem. No material exists at sealing position that assures superior tightness of sealing. Printing points photocell sensor is easy to adjust to eliminate waste of packaging film. Simply input packaging length in case of no printing points photocell sensor. The machine is available to equip with a nitrogen gas filling device, that allows the oxygen existing in product to be controlled within under 2%. The machine is available to perform perforating packaging function (Two or three packages perforating).